Nokia phones return with Android, Atmos and the classic 3310 | What Hi-Fi? Mobile World Congress launches are coming thick and fast, with the latest deployment of new smartphones coming courtesy of Nokia. The company has unveiled four new models: the Nokia 6, Nokia 5, Nokia 3, and a brand new version of the Nokia 3310, one of the company's most iconic phones. The Nokia 6 launched in China at the beginning of February, but it wasn't expected to arrive in Europe quite so soon, if at all. The handset boasts a 5.5in Full HD screen with an aluminium unibody. Inside, Nokia has what it's calling a "smart audio amplifier", which powers a dual-speaker set-up. Nokia claims this combination delivers "deeper bass and unmatched clarity". The Nokia 6 also features Dolby Atmos support. It's not the first time we've seen this application in a portable device, but we're yet to hear it in action. You can take your pick from four different colours: Matte Black, Silver, Tempered Blue and Copper, and the phone should cost around €229. 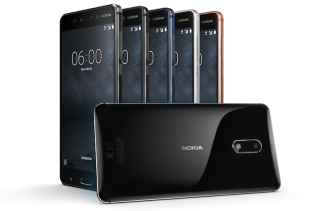 For these new phones, Nokia's put an emphasis on getting premium quality but without needing to pay flagship prices. To celebrate the global launch, there's also a special Nokia 6 Arte Black Limited Edition phone with 64GB of internal storage and 4GB RAM. This model comes in a special, high-gloss black finish. The Nokia 5 features a 5.2in IPS HD display and is powered by Qualcomm's Snapdragon 430 processor and Adreno 505 graphics processor. It's available in Matte Black, Silver, Tempered Blue and Copper and is set to cost around €189. The Nokia 3 comes in at around €139 and features a machined aluminium frame around a 5in display and 8MP cameras front and back. The Nokia 6, 5 and 3 all run Android Nougat and will feature Google Assistant, the company's virtual helper. Last but by no means least is the revamped Nokia 3310. It boasts a 22-hour talk time and should last a month on standby. Finishes are Warm Red or Yellow (both with a gloss finish), or Dark Blue and Grey (both with a matte finish). And, priced at just €49, it's a far cry from the flagship smartphones - but don't expect the same specs, it's a stripped-down, back to basics model (though there is Snake).